I couldn't get online much since the weekend. I had fun over the weekend with the dinner gathering on Saturday's night and a baking class on Sunday. We hosted the dinner at home, it was fun but made me feel so tired. I felt like my energy worn out that night. Baking class was a lot of fun from 10AM until 3PM. We baked a lot of cookies in the class. Hope the fear of baking will slowly disappear. We went to the immigration office on Monday to renew our passports so my kids were absent from the school. We couldn't make it if we had to wait until the kids went home from the school. The kids were happy because they felt like having 1 extra day for the weekend. 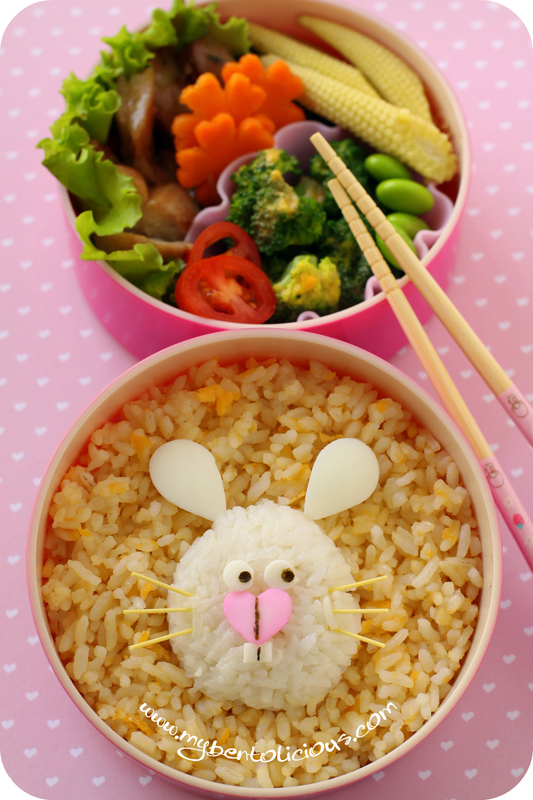 Yesterday was uninspired and unmotivated day to do bento, so I blamed on the lazy bug LOL :D Back to bento business today, I made a simple mouse on the top of the egg fried rice. I used hard boiled egg and dry egg somen to decorate the mouse. This one was quick and simple to do. But somehow, I felt my mouse looks like rabbit or a rabbit that looks like a mouse. Oh well ... let your imagination guides you, what do you see? Mouse or rabbit? Inside the other box : shoyu chicken, flower shapes carrot, cherry tomato, edamame, broccoli & cheese and baby corns. How cute. It looks like a bunny, but more like a Kangaroo mouse. I saw rabbit. Then when I read that it looked similar to a mouse, I saw mouse. But it doesn't matter...rabbit or mouse, it's cute. @KidsDreamWork : hehehe ... Thanks a lot Ai Ping! ehm...I saw bunny...eh, still can change my mind? err..a mouse..
arrgh, can't really decide because it is really really cute, Lia..
Rabbit! rabbit! That´s what my girls saw too.. they said "pupu!" (finnish word for bunny). See? And Lia.. don´t worry about your lazy bug. I have it ALL THE TIME. ahhahaah , really, I just pretend I am active most of the time ^_^. Nice that you had such fun weekend! I want to see your cookies soon :). And super great you manage to get your passports done.. now it is just planning for the holidays :). Planning for family trip?? So nice...have lots of fun and enjoy! hehee Lia, I think the ears belong to the mouse and the teeth belong to the rabbit ;DD Anyway it is very cute! I called it a rabbit on Flickr just a little while ago, lol :) It definitely looks like a rabbit to me,and it's so cute!! It sounds like the baking class was lots of fun, I need to take one too! Whatever he is, he's adorable! So cute ! I saw a rabbit ! I really like your blog ! Best regards from France ! @Mrs. P : hehehe ... thanks a lot Mrs. P! @Yeapies : Thanks a lot Yeapies! I saw a bunny, but I just learned to make bunny origami so I have rabbits on the brain!! Adorable as usual! @Bethanie : Thanks a lot Bethanie for your kind comment!